Availability: Available now. Special shipping conditions apply. See description text. The EcoSphere® is the world's first totally enclosed ecosystem - a complete, self-contained and self-sustaining miniature world encased in glass. Be wary of inferior and lower quality imitations. 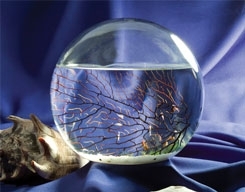 Easy to care for, an EcoSphere is an incredible learning tool that can provide powerful insights about life on our own planet... and provide a glimpse of technology that's shaping the future of space exploration. Because the living resources within the EcoSphere utilize their resources without overpopulating or contaminating their environment, the EcoSphere requires no cleaning and only minimal care. EcoSpheres have an average life expectancy of two years. However, it is not uncommon for shrimp populations to be thriving in systems as old as 7 years. EcoSpheres are available in either pod or spherical shapes, in a range of sizes. EcoSphere Associates can also custom design and install larger ecosystems for home and business use. Ecospheres are drop shipped from the manufacturer. Due to the added expense of overnight shipping and other arrangements there is a flat shipping rate of $70 for this EcoSphere tothe continental US. To order, you must have a valid email & phone # so that we can contact you to make shipping arrangements. Ecospheres are shipped with signature required. Although shipped overnight, EcoSpheres will not be shipped immediately, as we must make arrangements for shipping and delivery.